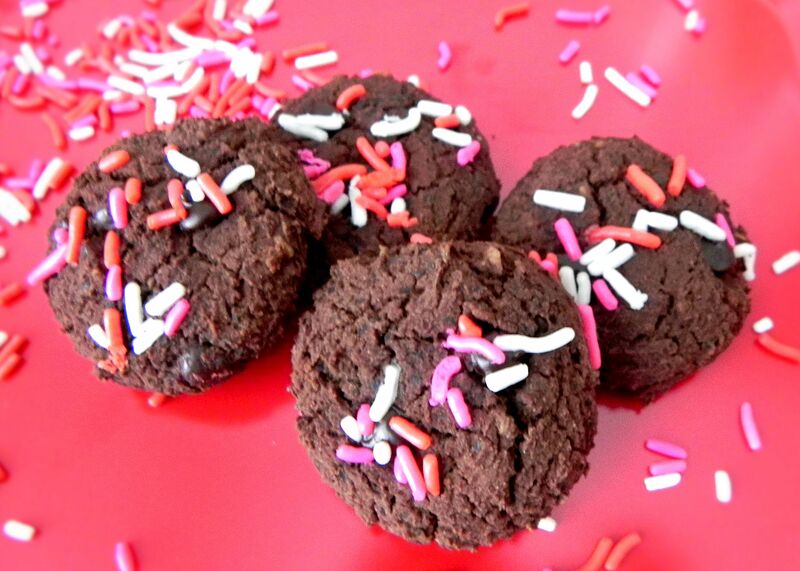 These cookies are the perfect dessert to round out your meal. I love using black beans as a secret ingredients in chocolate desserts to make them gluten-free and provide a little extra protein and fiber. Since they are mostly carbohydrates, enjoy them after a dinner that is high in protein and moderate in fat. Rinse and drain black beans and place in a food processor with nut butter, applesauce, milk, and vanilla. Blend until smooth. In a large bowl, combine flour, cocoa powder, sugar, cinnamon, and baking powder. Add wet ingredients to dry ingredients and mix together until a dough forms. Fold in chocolate chips and sprinkles. Using a small cookie scoop, scoop cookies on a greased baking sheet and slightly press down with your fingers so they are disc shaped. Bake for 15 minutes, remove from oven, and allow to cool.